As Palestinian survivors of the Israeli onslaught in Gaza huddle in the ruins of their devastated communities, it will be cold comfort to them to know that the weapons used against them have been developed – in part – in a country proud to be committed to a sustainable future: Wales. While the Welsh Assembly Government (WAG) talks of having “a real part to play in influencing change at home and on the international stage”, the truth is that Welsh taxpayers’ money is being used to subsidize the arms industry in Wales – an arms industry that is deeply implicated in Israeli war crimes in Gaza. The Israeli military employ UAVs (unmanned aerial vehicles) to target Palestinian homes, schools and hospitals. These are the Hermes 450, made by the Israeli firm Elbit Systems, using engines built in Birmingham. The pilotless drones are then brought to Parc Aberporth in west Wales for testing. This facility has been supported by £8.7m in grants from the WAG. Once the “targets” have been identified, next come the bombs. The Israeli military use Apache attack helicopters, which Palestinian human rights activists have described as “a symbol of indiscriminate military violence.” The Apaches rely on transformers made by Penny & Giles Controls of Cwmfelinfach, Gwent. Then there are the F-16 fighter jets, using components made by BAE Systems, which operates a munitions factory in Glascoed and runs a military training school in Cwmbran. 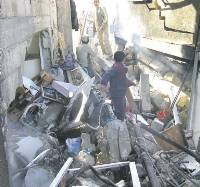 These same jets bombed the Shij’ia Family Health Care Centre in Gaza , which runs a mobile dental clinic wholly funded by the people of Wales through the Near East Council of Churches. Incredibly, the health care centre was telephoned 15 minutes in advance by the Israelis to warn them that they would be attacked – no case of “collateral damage” there then. Of course the Welsh arms industry doesn’t end there. With over 180 companies in the aerospace sector in Wales, we are now home to the likes of General Dynamics and Raytheon, makers of tanks, submarines, bombs, rockets and much much human misery. If only these companies would get together in one room so outraged Welsh taxpayers could show what they think of them… Well, quit dreaming. All of these murderous scum and more will be attending the Aerolink Wales 2009 exhibition, to be held at the Vale Hotel in Cardiff, on 7th April this year. 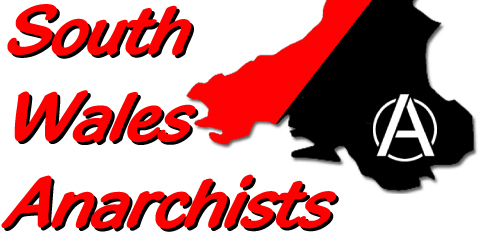 The South Wales Anarchists will be there. Will you? BAE Systems Land Systems Munitions, Usk, Monmouthshire, NP15 1XL. Tel: 01291 672211.